I came here for peace. And peace is what I found. It was the Malibu waters that washed away my tears and embraced me with its warm breeze, the sea salt a welcoming kiss on my lips. Still reeling from the tragic death of my brother, my life seemed out of control and unbalanced. And I seemed to gravitate to this place as if led by some unknown force. Malibu is not the place I would have envisioned for me. After all, it was home to the Hollywood stars that inhabit large mansions with ungodly price tags containing multiple zeros. Certainly not a fit for me. And yet, this is exactly where I ended up. At the end of the world, paradise as its final destination. It is where I have escaped, fleeing from the concrete jungle. Taking leave of the hustle and bustle, the chaos, the disarray of everyday living. Retreating from the army of four wheeled warriors all spewing poison as their weapon of choice. The chronic explosion of deafening sounds. The demons that seemed to inhabit my soul. Malibu is now home. Nestled in its majestic mountains with a peekaboo view of its crystalline waters and close enough to catch the scent of sea salt in the ocean breeze. White billowy blankets creep in practically unnoticed to inhabit the hollows of the canyon. And you wonder if you have died and gone to heaven as you look down on the clouds pierced only by one or two brave mountain peaks. In a not too distant past, the Santa Monica Mountains stood ablaze, as if hell trying desperately to expand its borders and invade paradise. But today, they stand regal and the orange glow that breaks over the mountain tops is simply the greeting of a new day. A new day in Eden. Where the redtail hawk soars with grace and elegance as it circles and circles above on a mission for self-preservation. Where the silence is interrupted only by the rustling of the leaves of the mighty oaks. The locals refer to my new home as the Bu as if trying to awaken someone into action. After all, it is inevitable to adopt the laid-back attitude this place brings. Even the currents in the ocean waters seem to have mellowed since the days of the Chumash who referred to the “surf that sounds loudly.” As I stand before the horizon of the lonely sea, the water lapping at my bare feet, all I hear is the hush of the waves. A whisper resembling a lullabye urging me to slumber. It is as if time has slowed down. As if life has rewarded me with a new timepiece whose hands seem to move at a much slower rate. The hours seem to stretch and warp into a longer existence. Making up for lost time. Missed opportunities. I love you’s never uttered. This is why I arrived here. 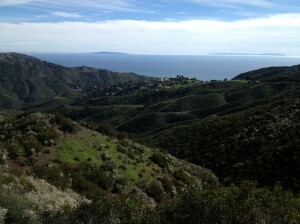 In the seaside town of Malibu whose name today instills a sense of quiet. Stillness. Freedom. Where I have learned to let my hair dance freely in the wind. Finding joy in the moment. Regaining a childhood sense of amazement. Taking nothing for granted. Fearless. The universe guides you where you need to be. Malibu. I came here in search of peace. And peace is what I found. About the author: Rossana G. D’Antonio is a civil and geotechnical engineer who up until recently had limited herself to technical writing. Most recently, she is venturing into her unexplored creative side through memoir, personal essays, poetry and short fiction. Rossana has recently completed her memoir, Tailspin, the heart wrenching experience of losing her brother in a tragic airplane accident. She finds peace in Malibu where she lives with her husband, Freddie.